I picked this restaurant from Google Maps, and it was a good choice. First of all, King Street is narrow and has little parking on the street anywhere near. I ended up parking in a city garage that is in the middle of the block that Leesburg Restaurant is on (you can park there for an hour free, and longer if you get a business to endorse the stub; Leesburg Restaurant does that). I got there around 1300 and left at 1345. It was a great meal! I started with a cup of chili. It had no heat, but it had really good flavor. There were a few beans in it, but it was mostly meat. Good stuff. I got a patty melt. It came with chips. That was some fine beef! It smelled good, and tasted great. The meat had a good crust on it, fine texture, and was cooked a nice medium well, with lots of juice (but not too much!). The chips looked like they had been made there. The iced tea was excellent. The people here were all super friendly! My check was $13.29. I would gladly eat here again. I drove past this place while coming back to my hotel after a great hike. It was a good choice. I got there about 1830 and left at 1940. It was pretty crowded as I got there; I had a 10-minute wait. I got a ribeye, medium, with a baked potato, and iced tea. The tea had just a bit of coffee aftertaste, but I added some sugar and it was fine. The ribeye came fairly quickly. It was, as I verified, undercooked, and it was rare in the middle. I fiddled with the potato for a bit, and started in on the end of the steak. It was a darn fine steak. It had great flavor, was tender, and had not a bit of charring. After I let it rest, it came up to medium, and was wonderful. I took my time with that steak. The baker was good also; with an artery-hardening amount of butter, bacon, and cheese on it. It was tender and tasty also. Service was pretty good, especially given how busy the place was. My check was $26.04, good value for a very good steak. A coworker and I were looking for lunch during the meeting break today, and we chose Rubino’s pretty much because we drove past it. We got there around 1144 and left at 1230. The menu is diverse, with pizza, pasta, cheesesteaks, salads, burgers, hot and cold sandwiches, and other stuff. I could smell the cheesesteaks, so that’s what I got. I ordered a supreme, which is a cheesesteak with mushrooms, onions, and green peppers (which I had removed). I got it jumbo, which is double meat. It was pretty darn good, just the right amount of juicy, and almost falling apart towards the end. They used mozzarella instead of Cheese Whiz, but it was still an excellent sandwich. They have brewed iced tea, excellent. My check was $11.52. I liked the place, recommended for an inexpensive and quick lunch. This place was really good! I picked it for a couple reasons: it was near my hotel and IAD (which I was flying into), and it was inexpensive. I got there around 1715 and left about 1800. My check was $19.22. You order by marking a strip of paper ala Which Wich. I got a cheeseburger with mayo, lettuce, and (a pleasant surprise) pickle relish. I upgraded from fries to onion rings. I also got an order of BBQ wings. The burger (advertised as a charburger) was EXCELLENT! A half pound of beef, thick, excellent flavor, a nice crust. That was fine beef. The mayo and lettuce was right on, and the pickle relish was a fine touch of flavor enhancement. The onion rings were OK at best, I think they were pre-fabbed. I’m getting fries next time. The ten BBQ chicken wings – I had every intention of carrying them back to my room to have as a snack, but I ate them all at the restaurant. Wonderful, tender and plump. The BBQ coating was excellent. I got iced tea, brewed and yummy. The staff was very friendly. This place is on my list for a visit to the DC area. Great stuff. And I need to try to fries. This is a slight catch-up post. I was coming back from the DC area last 19 Apr, and I ran across an ad for this place. It was near IAD, and so I headed over there for lunch. It was kind of disappointing. They server chopped sandwiches on (oh, and baby back ribs, but I don’t like those). I got a chopped beef sandwich and some plain beans. They don’t have tea, but only bottled drinks. The chopped beef was OK. The sauce didn’t have any heat and little flavor. My check was about $7. I won’t be back. What kind of BBQ place only serves sandwiches? Even the trailer places I have been to on the side of the road will sell you a platter. I had every intention of hitting Five Guys for lunch today, but when I walked by Virginia Kitchen and checked the menu I just had to try it. I’m glad I did! I ordered the honey-injected chicken. This turned out to be a four-piece traditional fried chicken meal. The pieces were a bit small, but for a lunch they were the right size. They had a nice crispy crust, and the meat was perfectly moist and had great flavor. The meal came with really good mashers (not enough gravy! ), and a mixed veg that was a bit mushy. The chicken is fried up when you order it, and it takes 20+ minutes to cook, so plan accordingly (there are a number of other good items on the menu, including breakfast). Service was good, the iced tea was excellent. My check was $11.88. This was a diner-like experience that I’m glad I ran across. I didn’t notice until I was checking out, but they had a cooler full of home-made pie in a lot of flavors. Five of us visited Stone’s today for lunch. We got there around 1215 and left around 1330. I got a “Blue Plate”, which essentially a cheeseburger and fries. The burger came with a thick slice of tomato (a bit *too* thick, I sliced it in two again), some thin onion strings, lettuce, and pickles. Curiously, no dressing. I added some mustard and that worked well. The beef was cooked medium well, and was excellent! The texture, flavor, and juiciness was perfect. That was one darn fine burger. The burger came with some really good fries also. I got iced tea, it was pretty good. Service was a bit slow, but not annoyingly so (I think there was only one server covering the bar and the bar tables). My check was $10.90. Pretty good burger for that, so decent value. I’d go back again. I have not been to a Thai restaurant before today. The guys I am working with here wanted to have Thai for lunch, and one of them had been here before, so off we went. After perusing the menu, I asked Vince for a recommendation, after having narrowed down the choices to a green curry or Pad Thai with chicken. He recommended the Pad Thai, so that’s what I selected. It was realy good! There were a mixture of flavors there I have never experienced. The thin noodles were really good, the chicken was thin sliced. I don’t know what the sauce was, but it wasn’t hot (spicy) at all. There was a small pile of chopped peanuts on the plate, so I sprinkled some of them on, and so added another flavor dimension. The meal was really good. I want to try some more in the future. I had iced tea to drink, and it was excellent. Service was very good; my check was $11.94. The meeting I was in yesterday finished a couple hours early, so I hustled back across town before the traffic rush hit, and headed out to Bull Run Trail. 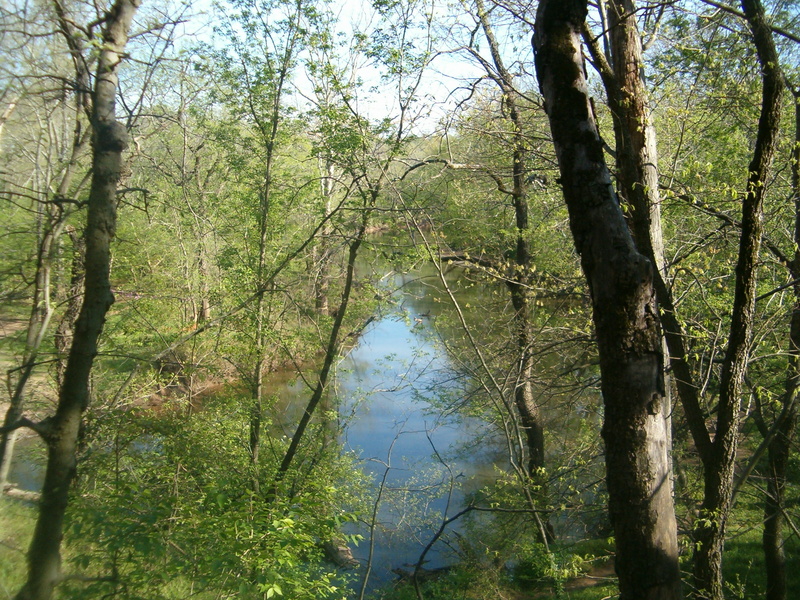 Hike summary: 6.7 miles out-and-back and a bit of a loop, along two stunning rivers. Started about 1615, ended around 1930. I first hiked part of this trail more than ten years ago. I had driven across it several times over the years, and had noticed the faded sign for the trail, and drove to it one evening, and put in one of my first 10-mile hikes, a five-mile out-and-back to the east. I remember it was a beautiful area. 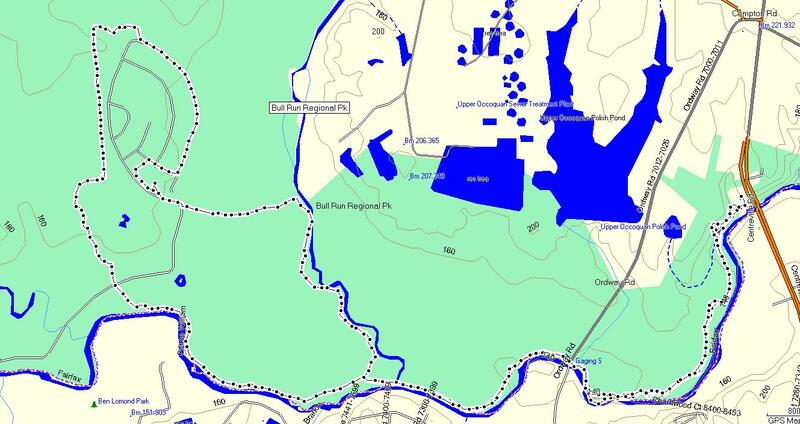 A couple days ago I did a little research on the trail, and found it was part of a 17-mile trail that ran from Bull Run Regional Park towards the Potomac. I decided to go back to the trailhead and go west this time. The trailhead has a decent sign now! There was also new signage at several places. Route 28, which runs south from Dulles Airport, runs over the Bull Run. There is a nice like ripple there. BTW, there is no water at the trailhead, nor is there any to the east that I remember. There is water at the Regional Park to the west, but it’s 2+ miles, so bring your own. There are no heads until the Park, either. From the parking lot, you walk a couple feet down towards the river, and quickly run into the trail. I went right (west). You immediately come to the only hill of the hike. It’s probably 80 feet up and almost immediately 80 feet back down. There is a really nice view of the river from the top. Turns out the hillock you just walked over is a shale formation. The shale has been used as stair steps for walking down the west side. 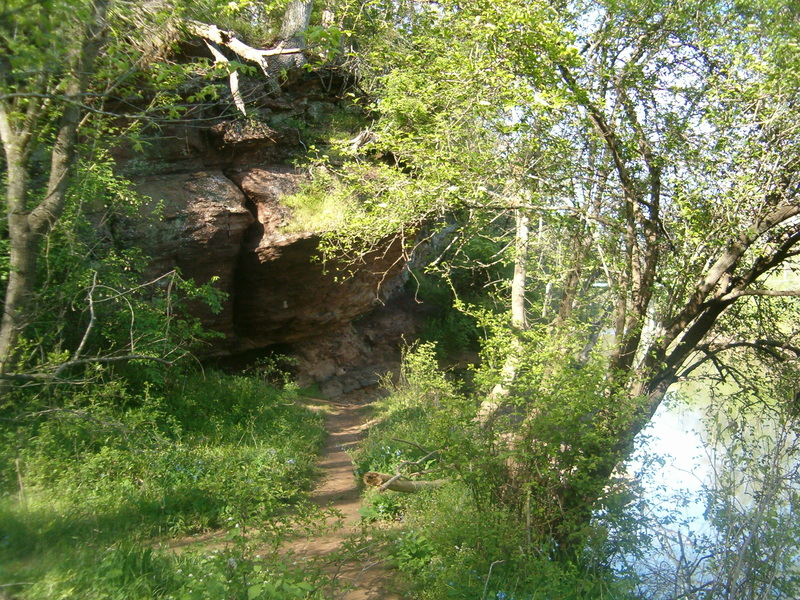 There is a very pretty bluff formation, and shale lining the river. It’s very pretty. 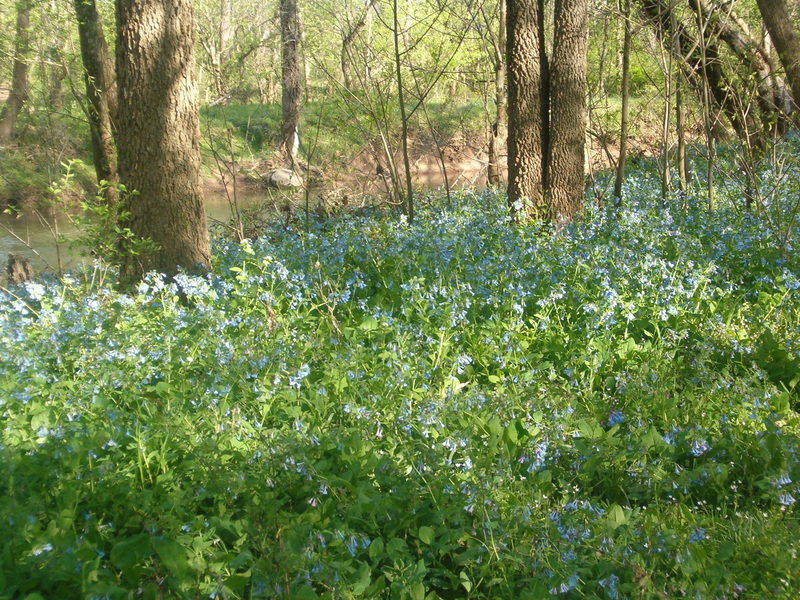 There are thousands of pretty bluebell flowers along the trail on both sides. 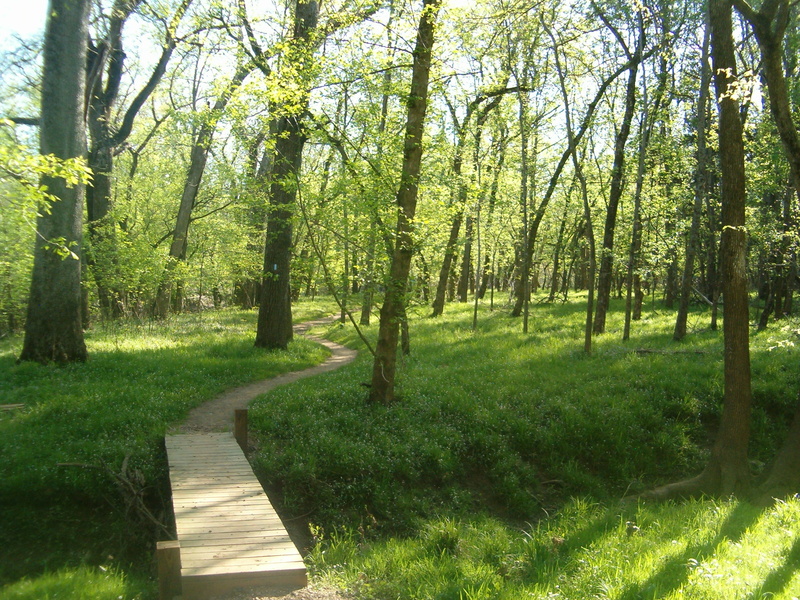 The trail winds around through bottomland. Every once in a while, it’s a bit marshy, I’m guessing mainly from the rain they had a couple days previously. There are logs and some bridges where needed. You walk along the river for most of the trail. 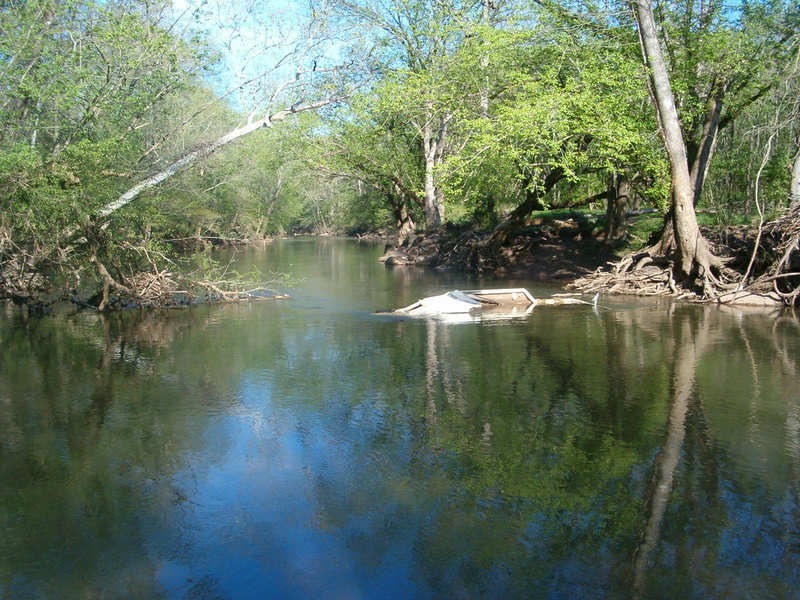 The river is always pretty, sometimes flowing fairly fast, and sometimes very lazily. At this point, there was a boat sunk in the middle. Kind of strange. 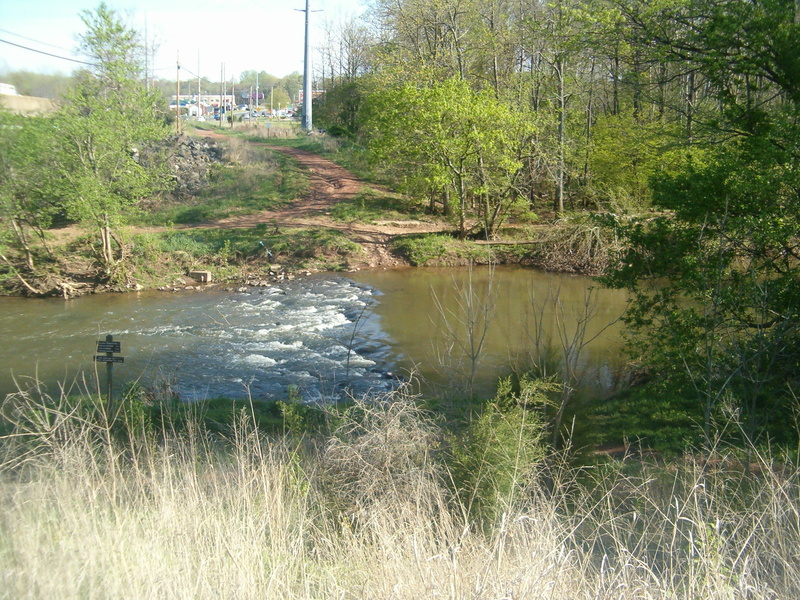 Eventually, and after crossing under another road, you reach Bull Run Regional Park. 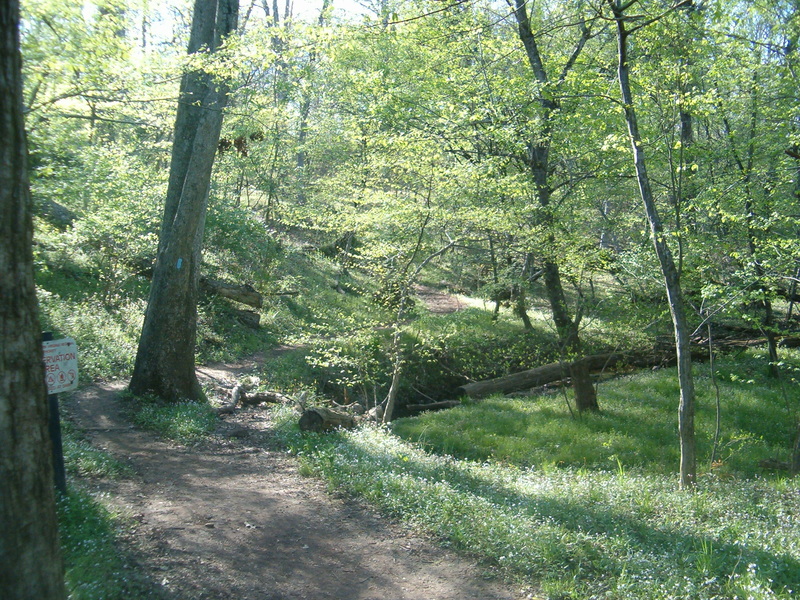 The signage is not very clear, but the Bull Run Trail shares with the Bluebell Loop Trail. I took the left, which was supposed to be the southern part of the Bluebell Loop. It follows the river some more. Eventually, it runs into a frisbee golf course. There are white blazes that just… stop. I walked along this straight-as-an-arrow road/trail for a bit, and then thought it veered off to the west. 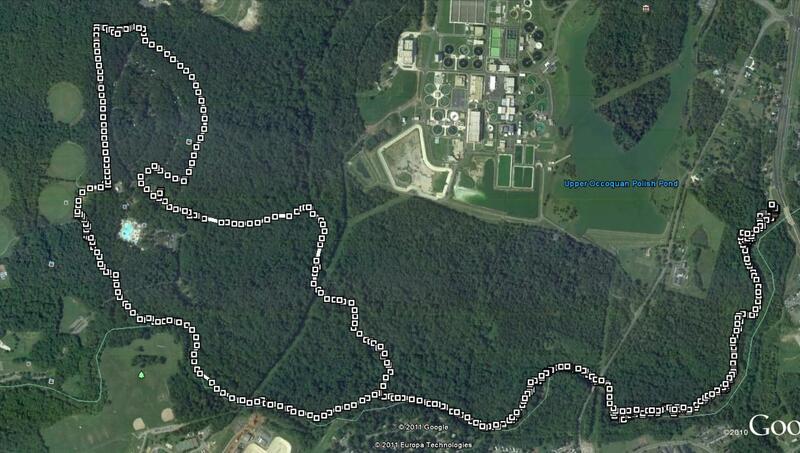 Looking back at the Regional Park map (see below), I think I got onto the Yellow Trail, but the trail was quickly lost. I bushwacked through to a road that was by some soccer fields, and eventually found the white blaze trail next to a maintenance yard. I followed that trail north a couple hundred yards, and just by luck saw some white blazes off 90deg to my right. I did some follow-the-blazes combined with sorta-bushwacking, and eventually found the camping area. I followed the road south until I got to the admin area, and then finally found a map that pointed me to the trailhead for the combined Bluebell/Bull Run trail. The lessons learned here: print the damn park trail map in the hotel before going off on the hike. On the other hand, there could have been better trail blazes in the park. 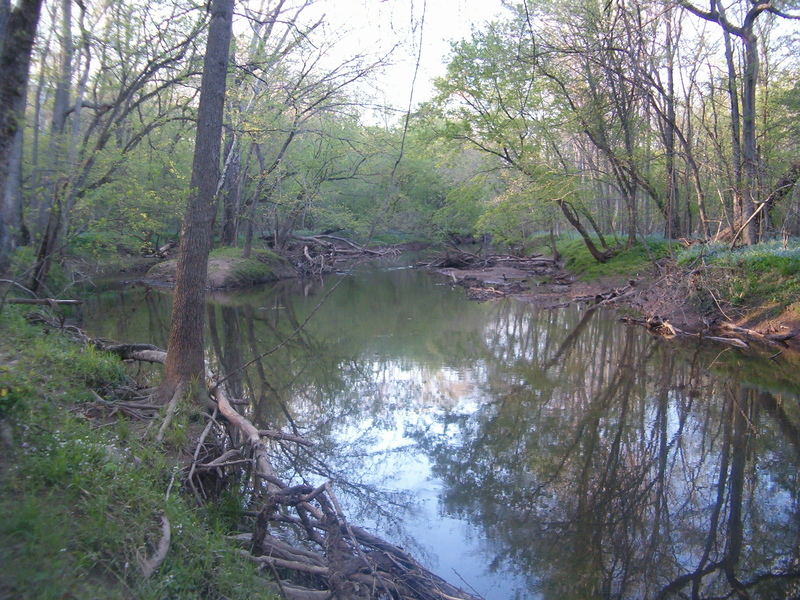 The trail from this point follows the Cub Run (I guess small rivers are “Runs” here). It is also beautiful, and there are so many bluebells it’s amazing. The run back along the trail was eventful in that I scared up *two* large herds of deer (at least 10 individuals in both cases), saw what I believe was a muskrat swimming in Cub Run, saw and was honked at by 10 or so geese, and saw a number of pretty gray squirrels. The trail had 100% cell coverage, which allowed to me to take business calls from two friends along the way. A comment about this altitude plot: I do not believe it, I think. I take the data as downloaded into the Garmin Mapsource program, and paste it into an Excel or Open Office spreadsheet. I run a search and replace to change (for example) “257 ft” to “257”, and then run an XY plot. Now, I went from the parking lot about 40 ft down to the riverbank, then up an 80 or so foot hill, then back to the river. None of that matches the altitude plot. I also question the big dip about 2/3rds of the way along the hike. I’m going to have to look closely at these numbers. I know that the GPS has wildly inaccurate altitude numbers when first starting and “settling down”, but these are just a little too random-looking. 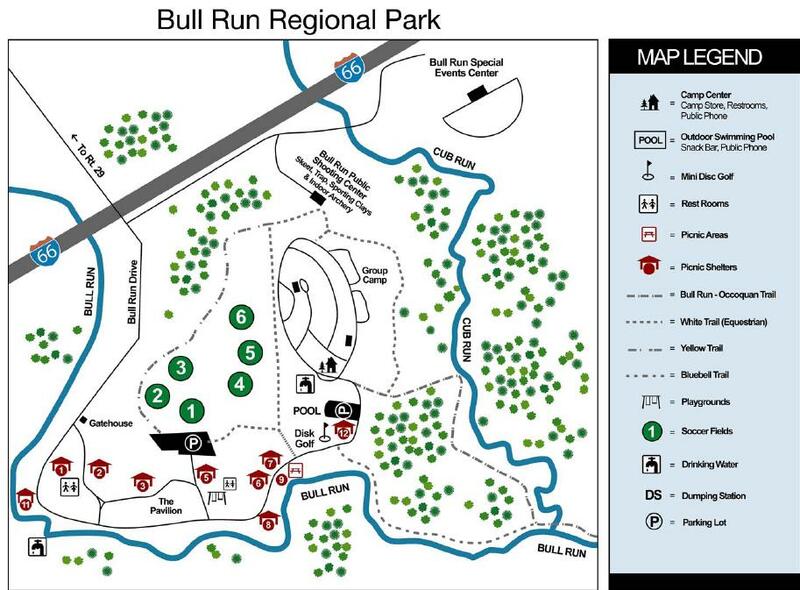 This is a Bull Run Regional Park trail map. Overall, this was a very nice way to spend a couple hours. I saw exactly *four* people on the trail the entire time. All four of them were in the Regional Park; there were no other people on the Bull Run part. There were no problems with mosquitoes, although there were occasional swarms of some kind of gnat periodically. I’ve seen these restaurants at various places, but never tried one. Wednesday the location right across the Dulles Tollway was recommended by a couple of the meeting participants. A work friend and I headed over to try it. We got there around 1215 and left around 1315, the place was only about 25% full the entire time. I ordered iced tea, which was very good. I got a chicken ceasar salad and a bowl of potato soup. It was all very good, but it was a huge amount of food. I ate all the soup; it was excellent. The salad was pretty good also. I asked for some extra dressing and that made it even better. I finished only about 90% of the salad. Service was pretty good. My check was $18.27. Kind of expensive for soup and salad, but I guess not excessively so for the DC area. I have been eating at the Hamlet for probably 20 years. They make a consistently good burger. Yesterday I went there for lunch with a couple work friends. I got a hickory burger, which is a cheeseburger with BBQ sauce on it (as opposed to true hickory sauce). The burger was perfectly cooked, with a nice crust, and medium well, so it had a bit of nice juice. It came with the usual stuff like lettuce. The fries were pretty good also, fried just right and just crunchy enough. The iced tea was strong and more or less kept refilled. We had one problem – a late arrival to the table didn’t get his order put in by the server, and so he had to get his to go. The server didn’t give any discount, but after John spoke to the manager he comped the lunch, and gave John cards for two free lunches to boot. We got there around 1155 and left at 1300. My check was $16.85. Good stuff! I went for a walk this evening, I wasn’t very hungry. After I walked about a mile, I was. And Lucianos was right there. I got there about 1930, and left about 2015. Then I walked back to the hotel. The iced tea was pretty good. I ordered chicken parmigiana, with a side of spaghetti. The meal started with a salad that had a vinaigrette dressing. It was pretty good. I started eating it, and got about 10 bites into it, and there came the main course. Too fast, I think. So I didn’t finish the salad. The chicken parmigiana was excellent, a single plump breast with just the right amount of light breading and marinara. It came with a mixed veg medley that was pretty much perfectly steamed. Not a scrap of any of this was left. I had asked for the spaghetti with meat sauce, but it came with “plain” marinara. My check was $20.99, which I think was a little high (but, this is the DC area). Service was excellent. A couple friends and I went here for dinner this evening at the recommendation of a work friend who lives in the area. It was a great recommendation. The meal started with some very crusty and rough bread. There was EEVO on the table, we asked for garlic in oil and balsamic vinegar, and that made the bread that much better. I got iced tea. It was strong! In fact, after a bit, it was *too* strong, and had a distinct aftertaste, I think coffee. I put some sugar in it (a rare occurrence for me), and it was masked mostly. I got pollo marsala; it was excellent. The sauce was a bit thicker than some I’ve had before, but had good flavor. It was a single, albeit large, chicken breast. The dish had some excellent sauteed mushrooms on it as well. There were some cauliflower crowns with the meal, but they had a spicy dusting on them that I found unpleasant. Next time I would ask for something else. My check was $21.04. Service was very good. We got there around 1930 and left around 2130. Recommended. This is a real time post. I picked this place because… there was a traffic jam due to a wreck, so I pulled in as I slowly passed by. The iced tea is strong, and good. I got a Shepard’s Pie. It’s hotter than heck, but done right! Good mashers on top of beef and veg, and baked. Excellent, I would say perfect. My check was $13.31. Service was casual, but not bad. They have a good wifi for customers. It’s WEPed, but ask for the key and they give it to you. Tonight I got into DCA pretty late, after a longish day of traveling here from OKC. I checked into the hotel, dumped my stuff in the room, and literally ran a couple blocks to meet work friend Jay who was staying into another hotel. We met at the intersection of 23rd and E in Arlington (the Crystal City area), and picked the Cafe Italia basically at random, since it was across the street. We got there about 2140; the restaurant closes at 2200 but we were welcomed. There was a party of about 10 leaving, another party of two, and another party of six there. Service was quick. The iced tea was good. The salad course was a very plain lettuce salad (a mix of several kinds) and dressing; the ranch dressing was thick but tasty. I ordered a variation of chicken alfredo primavera, sans premavera. The noodles were al dente, the chicken was sauteed. The alfredo was very good. There was a largish amount of food; I was filled up and then some. We left around 2230. My check was $18.75. I would go back there again with no problem. Update, 23 Aug 2010: I found the check from this meal, and this is an update based on that. It occurred to me this evening at dinner that we had eaten here during our trip to DC, but I had forgotton to write about it. Raegan and the kids and I had been to Great Falls National Park, and came through Tyson’s on the way out of the DC area, and stopped at Silver Diner in Tyson’s Corner. I had eaten at the Diner several times over the years. It was really good, then there were a couple times it, to be frank, sucked. This visit was good! A couple of us started with milk shakes. My vanilla shake was excellent. The iced tea was also. I got a cheeseburger that I really liked. Well cooked, a good size, and good beef. Ian and Erin both got a chicken fried steak and it was outstanding! The gravy was good. Ian ate all of his, but Erins was way too much for her. Raegan got a “Choose Two” soup and salad, with a crab soup and a Club sandwich; she liked them both. We all got milkshakes as well. There were a couple vanilla and one chocolate. They were cold, and large, and great! Our check was around $55.45, and I thought it was good value for all we got. They have wifi. The service was pretty good. Recommended. This was a jewel of a restaurant! We had come out of Shenandoah National Park, and were looking for dinner. We just missed the country home cooking place that closed at 2000, as it was 1955. We decided that Italian was just the thing for us. The restaurant was about 75% full when we got there; we were seated immediately. My iced tea had just a touch of coffee flavor, but I put in 1/4 packet of sugar to mask it, and the refills after that were good, with no aftertaste. We started off with some cheese garlic bread. It was good but pretty standard. Raegan and I got salads with ours, they were OK. I got the chicken parmesan. Excellent! Came with some spaghetti with meat sauce, also excellent! Nothing left. Erin got fettucine alfredo. Excellent! Ian got a meatball sub. He didn’t eat the bread for the most part (he’s weird about that), but the meatballs were completely gone. Raegan got manicotti. Her standard thing for two manicotti is to get one with with alfredo and one with marinara. Our server (who was very good) was a bit taken aback by this, and so was the cook apparently. They were concerned that the alfredo and marinara would… touch! When asked about this, Raegan said, sure, let them! They still came to the table on two plates. Kind of funny. She ate it all. We were done about 2100. The place was still 75% full. Our check was $46.79. Service was excellent. Turns out that the people that own Ciro’s also own the Tex-mex place in town. If it’s like Ciro’s, it might be pretty good. We were headed out of Blacksburg last Sunday after touring the campus and part of the town, we were hungry, and it was lunch. We had sort of wanted some fried chicken, and as we gassed up on the edge of town, the station had a Bojangles co-located. We got a bunch of chicken, both light and dark. It was pretty darn good, just basic fried chicken. We got green beans, mac and cheese, fries, mashers, and biscuits. You sure could do worse than get chicken here. Yesterday after we left DC, we headed west on I-66. After the usual random stops along the interestate, we made our way to Port Royal and hit the park. This is a pure scenery park. 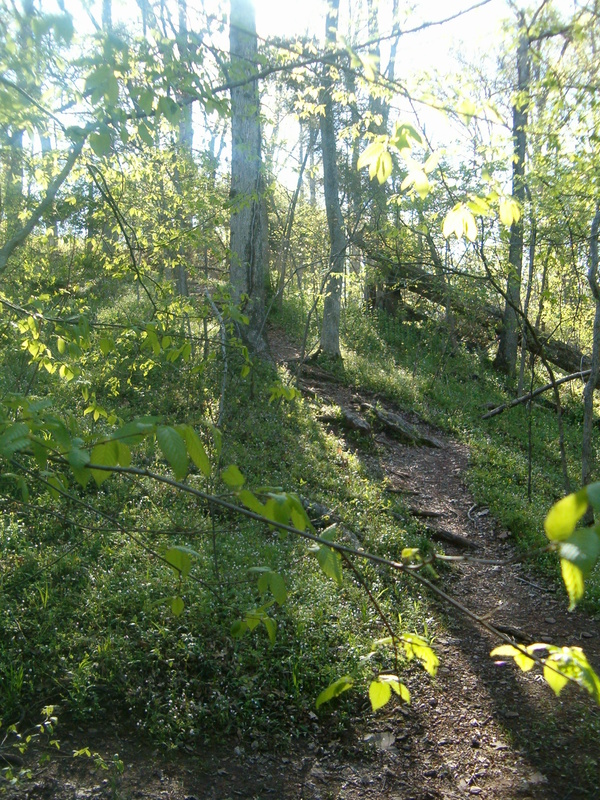 There are three things to do – visit the Visitor Center(s), drive the Skyline Drive, and hike. We managed two out of three. The views along the Skyline drive are pretty. They are not Yosemite, and don’t rival the drives through the Rockies, but are still breathtaking. We saw two bears (one a cub) and a number of deer right along the road. The trees are beautiful. If you only have a couple hours, drive the Skyline Drive. Otherwise, try to do some hiking – there are trails everywhere. It’s a nice National Park to visit. I have eaten at this restaurant a couple times in the past few years. It was pretty good, not excellent, but certainly not bad. This evening I got there about 1800. I was immediately seated, the Cafe was about 40% full. I ordered iced tea – it was strong and very good. I ordered the pot roast. The pot roast was not the best I have ever had, but it was also far from the worst. It was tender and wasn’t dry. It was not overly flavorful. It could have used something like an onion-flavor au jus. It seemed to be roasted with carrot slices, which would not have imparted much flavor. The meal came with good mashers and a mixed steamed veg mixture. The mashers were hotter than heck and had a lot of flavor. I got a bowl of potato cheese soup; it was OK, and was mostly cheese. After the meal, I got a scoop of vanilla bean ice cream, yum. The service was excellent. I left about 1930, my check was $18.87. The Cafe was about 70% full. The place has wifi. This was an accidental meal. I was meeting the son of a friend of ours since he goes to college in DC. I picked what used to be a Ruby Tuesday in the Pentagon City Mall, since it was easy for Jonathon to find it from the Metro. When I got there, I discovered that the Ruby Tuesday was gone and the Harry’s was in its place. I ordered the Firehouse Chili and the cheeseburger. The chili was excellent! It had beans in it (two kinds, kidney and something else), but it was meaty and tasty and had just the right amount of spice. The burger was smallish, and didn’t fill up the largish bun, but was tasty. The two together did a good job of filling me up; the burger came with kettle chips that were OK. I topped it off with a scoop of vanilla ice cream, and Jonathon got some cheesecake. Service was outstanding. The kitchen closes at 2130, but the bar stays open later. The tea was excellent! I like keeping in touch with friends from high school and college, and people who I no longer work with. I ran across one such friend that I had not been in contact with since around 1986, and it turned out she and her family live in Falls Church. During my last trip to DC, we made arrangements for all of us to get together, and she suggested the Sweetwater Tavern. It was 6 miles away from where I was staying in Tysons Corner, VA. We were to meet at 1800, so I drove out of my hotel at 1740. I arrived at 1820 (that’s 40 minutes to drive six miles, about 9 miles an hour). You would end up sitting for five minutes, and then drive for a minute. So I guess after not seeing her for 20+ years, being 20 minutes late isn’t earth-shattering, but it really annoyed me. The restaurant was really nice. It was a little bit too loud. The service was OK. There were a couple times where we did not see a server for a bit, but the iced tea was kept full, at least. I got a roast half chicken (apparently popular, it was labeled “until it runs out”). It was excellent. The chicken was tender and moist, and had a great flavor. The chicken came with mashed potatoes (very good) and some corn (not very much, maybe they were running out). All very tasty. We shared a dessert of chocolate waffle and ice cream – yummy. The meal was really good, but the best part was the conversation with my friend and her husband, who I had not met before. We had quite a number of mutual interests. They had a pair of cute and bouncy little girls also. They were kind enough to pick up the check, so I owe for the next time, but my chicken was about $10 IIRC. It thought the prices were pretty reasonable, and the portions were not huge, but just about right. The restaurant was crowded when I got there at 1920, and there were about six people waiting for a table. It was just as full when we left around 2100. I did my usual thing for dinner tonight, I fired up Google Maps, and asked for “restaurants near Tysons Corner, VA”. One of the entries was for O’Malley’s. I drove over there (it was about 10 blocks from my hotel, and I didn’t feel like walking this time). It took a couple passes, and I couldn’t find the place. I finally called, and the call was answered as “Crowne Plaza, where may I direct your call?”. The place was in the hotel. Note to O’Malley’s webmaster: this would be a nice tidbit for your website. I walked the place finally, and knew that I had been in there before. I gave it some thought, and finally remembered that I had eaten breakfast there, when I had stayed in the hotel, which was then a Holiday Inn, about 10 years ago. I ordered a cup of beef vegetable soup and a Shepards Pie, along with iced tea. The tea came. It was instant tea, or concentrate. Probably concentrate. It wasn’t totally horrible. But it wasn’t very good, either. The vegetable beef soup was pretty good. It had more chunks of meat and stuff. The Shepards Pie was really, really good. It had almost a chili consistency for the filling, and it was more red than most Shepards Pies I have had. It had peas and carrots mixed in. A traditional SP has a spreading of mashed potatoes over the entire top, but this one had scoops of mashed potatoes embedded in the filling. No matter, it was really, really good. I really like cassaroles and the like, and Shepards Pie is at heart a cassarole. The key is the filling, and in this case, the filling was excellent. It wasn’t huge, either, and that was good since I wasn’t terribly hungry. I got there around 1845, the place was not even 15% full. When I left at 1927, it was about half full. My check was $14.44. The place had a lot of TVs with mostly sports on; a couple of them also had news on. It wasn’t too loud, but it was louder than most restaurants on. It was also well-lit, which was good since I took my USA Today in to read, and work the puzzles.